THE game was up. The war was lost. Their leader had killed himself. So why would Adolf Hitler’s aides have gone to such lengths and risked their lives to take his body and that of Eva Braun out of his bunker, under fire from Soviet artillery, and try to burn them beyond recognition? It is a sinister thought but conspiracy theorists all over the world will be asking once more: Did Hitler really die in his bunker? Historians have generally agreed since the end of the Second World War that, staring defeat in the face, an increasingly feeble and paranoid Hitler had married Eva Braun in the bowels of his Berlin bunker after midnight on April 29, 1945, and later dictated his will. His physician Werner Haase, in response to Hitler’s questions, had recommended a dose of cyanide and a gunshot to the head as the most reliable form of suicide. Hitler, convinced of the treason of SS leader Heinrich Himmler, doubted the reliability of the SS-supplied cyanide tablets and had one tested on his dog Blondi, after which the dog died. Following lunch on April 30, with Soviet forces less than 500 metres from the bunker, Hitler and Eva said goodbye to staff and fellow occupants, including the Goebbels family, private secretary Martin Bormann and military officers. They went into Hitler’s personal study at 2.30pm and at around 3.30pm some witnesses reported hearing a loud gunshot. Those, including valet Heinz Linge, who went into the study reported the smell of almonds, consistent with cyanide gas. They said they saw Hitler slumped on his desk with a bullet wound to his head, a pistol on the floor and blood pooling on the arm of the sofa on which Eva lay beside him with no visible sign of injury. Several witnesses said the bodies were then carried up to the emergency exit and into a small bombed-out garden behind the Chancellery where they were doused with petrol and set alight, then buried in a small crater when the Soviet shelling made it unsafe for the cremation to continue. Seven and a half hours later, Red Army troops began storming the Chancellery and the remains of Hitler, his wife and two of his dogs were said to have been discovered in a shell crater by a Soviet soldier. Joseph Stalin told Western leaders at the Potsdam conference in 1945 he believed Hitler may have escaped to Spain or South America. The acting chief of the US trial counsel at Nuremberg, Thomas J Dodd, said: “No one can say he is dead.” The most convincing evidence of Hitler’s suicide came from the testimonies of those who were in the bunker — but they did not all agree on the details. But Misch decided not to go, in case the “last witnesses” were shot. He was later captured after fleeing the bunker and spent eight years in Soviet prison camps. Details of a Soviet autopsy on the remains they found, released years later, apparently showed gunshot wounds and cyanide poisoning. The remains were repeatedly buried and exhumed by Russian agents during their relocation from Berlin to a new facility at Magdeburg. There, they were put in an unmarked grave with the bodies of propaganda minister Joseph Goebbels, his wife and their six children. When the facility was due to be handed over to the East German government in 1970, the KGB, it is said, exhumed all ten bodies, burned them and threw the ashes in the river Elbe to prevent the area becoming a Nazi shrine. They kept Hitler’s jaw and part of his skull — the fragment now thrown into doubt by US archaeologist Nick Bellantoni, who was given permission to examine the artefacts in the Russian state archive. Other discrepancies which have muddied the waters include a photo released by Soviets at the time of the fall of Berlin which purported to be the body of Hitler, shot in the forehead. It is now thought to be one of Hitler’s body doubles. Hitler and Eva Braun escaped from the bunker on April 22, 1945, leaving behind doubles who killed themselves or were murdered. They were flown to Norway where German subs were waiting to transport them away from Europe. They were helped by the Vatican to escape to Spain then Argentina. Two German submarines seized by Argentina after the war had delivered Hitler to a secret Nazi base in the heart of Antarctica. The Falklands War was fought by Britain not to protect the islanders but the secret that British authorities knew about the Nazi base in nearby Antarctica. Hitler thrived in a community of Germans in Argentina where he went under the alias of priest Father Krespi. When ‘Krespi’ died in 1993, Germans from all over the world flew in for the funeral. 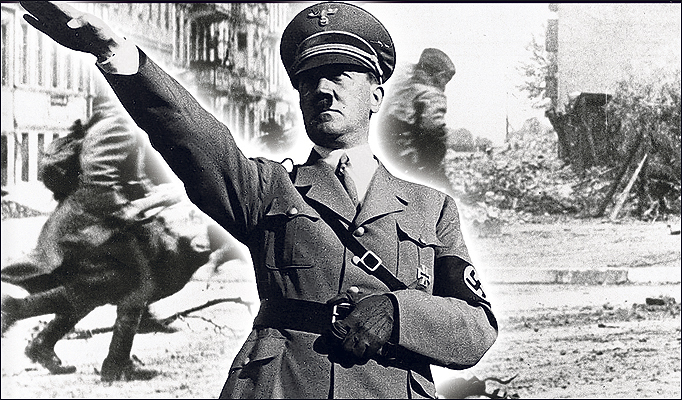 Using rocket technology, the Nazis sent Hitler to a secret base on the moon. Not all of the theories are so far-fetched. In the book Hitler’s Escape, by Ron T Hansig, the author argues that the Nazi leader may have made his getaway to Spain. It claims that Gestapo chief Heinrich Muller told his American interrogators in 1948 that he had arranged Hitler’s escape and that the German leader and Eva Braun flew to Barcelona on April 26, 1945. So did Hitler survive? Were the details of his death deliberately muddled by the Soviets?